Spring is here, and that means you’ll get even more use out of your porch enclosure. 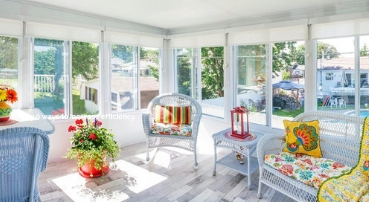 Though your porch enclosure can be enjoyed throughout most of the year, the longer days and fair weather of spring make it the perfect time to enjoy your morning coffee, read a book, or spend time with friends and family on your porch enclosure. For many homeowners, however, spring also spells the time for spring cleaning. This is especially true if you didn’t use your porch enclosure much during the winter. If you need to do a little maintenance before you start to use it, here are some of our favorite tips. You might think that the best day to clean your porch enclosure is a bright, sunny day so that you’ll have more light. However, sunlight can be fickle. It doesn’t shine evenly through every part of the room, and sometimes causes harsh glares that can be distracting. More importantly, warm, sunny days can dry out your cleaning solution before you do and cause unattractive steak marks. A cloudy, cool day is probably best for cleaning your porch enclosure. You’re going to be using water to clean, of course. You’ll want to remove any upholstered furniture, rugs, or anything else that could be water damaged from the porch enclosure before you get started, just to be safe. If you have any plants in the porch enclosure, those should be moved out of the room for the moment, as well. Abrasive cleaning solutions, like bleach, can damage your porch screens — and they’re really not necessary to get the job done. Mild dish soap and warm water should be sufficient. Wet the screens and then scrub with a soft bristle brush to gently remove any buildup. Once that’s done, rinse the screens and make sure you don’t need to go over it a second time. This gentle cleaning process will keep you from scratching the screen while still effectively cleaning it. If you find you have issues with mold, algae, or stains, don’t immediately jump to bleach. You may be able to remove it with a mixture of vinegar and hot water and a scrub from your soft bristle brush. If that doesn’t work, only then should you resort to bleach, but make sure it’s diluted. 3 parts water and 1 part bleach should do the trick. Again, you probably won’t need to use a pressure washer in order to clean your porch enclosure. At most, a garden hose should be sufficient to rinse the space. Power washers can also do quite a bit of damage to your porch enclosure. The power can put too much impact on the screens, as well as damage the porch decking. The good news is that porch enclosures from Sunspace Texas are remarkably low maintenance. They help to keep pests out and their sturdy windows are impact resistant, so they’ll look great for longer with less maintenance. Want to learn more about our porch enclosures and how to maintain them? Contact Sunspace Texas today. ← College Station’s 2018 Small Businessperson of the Year Revealed!